There are so many natural supplements on the market that all have the same promise but when it comes to varicose veins, it is important to look for a formula that targets the root of the problem from inside out. 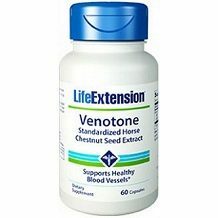 The purpose of this review of LifeExtension Venotone is to provide you with all the factual information you need to know about this product. Venotone advertises that it only uses a high-quality formula that is effective for providing relief from pain, heaviness, and tension in the legs. The only active ingredient in this formula is Horse Chestnut extract. Some studies have shown that this extract may help to reduce swelling, pain and water retention. It is also useful for promoting healthy circulation and thinning out the blood which prevents it from leaking out of the veins and capillaries. While there are some studies that have shown these benefits, there is not enough sufficient evidence that this ingredient alone can reduce the signs of varicose veins. LifeExtension suggests taking one capsule every twelve hours or as prescribed by a physician. It is recommended that you use this product continuously for 6 to 12 weeks for the most effective results. According to research, Horse Chestnut extract may cause dizziness, headaches, upset stomach and itching. You should always consult your doctor first if you or pregnant or have allergies or if you have liver or kidney dysfunction. This product should not be taken together with full strength aspirin. A single bottle of Venotone contains 60 sustained-release capsules and retails for $27.99 per twin pack. This product can be purchased directly from the manufacturer online. Besides the twin pack deal mentioned, we were unable to find any discounts or coupons available for this product. LifeExtension only offers a limited money back policy for products that have been unopened. This is not a satisfaction guarantee which means that should you be unsatisfied with the product you may not qualify for a refund if you have already used a portion of the capsules. We appreciate that this product is affordable based on the twin pack deal, and we like that LifeExtension is transparent about the ingredients in this formula, however, based on the research we did, we feel that Horse Chestnut extract on its own may not be as effective as other formulas that contain a few more supporting ingredients. We also feel that the guarantee policy is weak and has provided us with no confidence in this formula. We were disappointed to find that there was not much feedback from consumers about this product which means there is not enough sufficient evidence to show that this product is effective at all. In conclusion to this review, we advise consumers to look for alternative options from reputable brands that offer a full money back guarantee and has a formula which contains enough potent ingredients to prevent and reduce the appearance of varicose veins.